Shoehorns come in all shapes, sizes and materials and while finding the right one is a matter of personal taste, using one is absolutely essential. Shoe horns prevent damage to the counter cap and keep your footwear good looking for the longest time possible. Shoehorns crafted from horn, stainless steel or wood are amongst the best on the market and a must for serious shoe lovers. Horn shoe horn with deer antler handle. 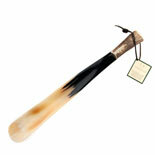 Short horn shoe horn with deer antler handle. First-class shoe horn, crafted from Abbeyhorn. For an elegant entry into your shoes – our metal shoe horn. Long wood shoe horn made of beech. 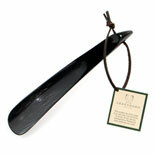 A shoehorn is an elegant aid to slipping into your footwear. Using one should be obligatory, because it helps to guide your feet into the shoes whilst protecting the vulnerable counter cap from wear and tear. One of the biggest care failures of all is bad shoe entry and exit: For example, instead of opening the lacing when taking their shoes off, many people step onto the counter cap to free their feet. Even during entry, shoe lacing is too often left closed and the foot forced into the shoe. Doing that is guaranteed to ruin footwear and it is only a matter of time before abrasion, spots and holes appear on the counter cap of your shoes, ruining its original shape. To keep your footwear looking good for as long as possible, always open the lacing and use a shoehorn for every entry and exit. Shoehorns are available in numerous shapes, colours, sizes and materials, so finding one to suit your own personal taste should not be a problem. Whether you use a horn, a wooden or a stainless steel shoehorn, make it part of your everyday routine and enjoy your favourite shoes in perfect condition for longer. Shoehorns with a long shaft are an useful way to avoid having to bending down to put on your shoes. What is most important though, is the rounded blade that fits the inner construction of most shoes. The curved end is pressed against the shoe’s back and the heel will slide easily along the shoehorn’s concave side into the shoe. Sharp edges are avoided, which damages the leather and the counter cap. 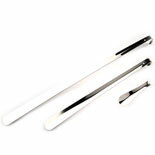 While a shoehorn’s material is a matter of preference, it should be neither too flexible nor break easily. Thin plastic or aluminium shoe horns tend to loose their shape or even snap. 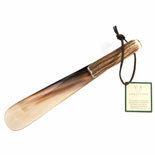 Horn, wood or stainless steel are the best materials for a durable and elegant shoehorn. By the way, if you visit friends or often travel for business regularly, our small travel shoe horn will fit into any bag.